This project, like most projects I take on, has a very unstable vision that keeps shifting as I consider multiple color combinations. I went into this a lot more realistic than I usually do. 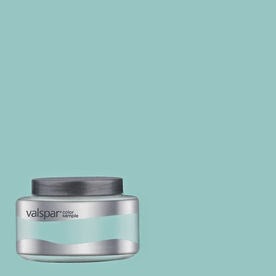 I knew I was going to use the color Weathered Glass in the Valspar Eddie Bauer palette, but other than that, I knew I was going to keep an open mind. Peanut Head was in the background insisting that I use some of the stockpile of leftover paint we have from my many painting sprees. That's where the light tan comes in. It's our token color just for Peanut Head. 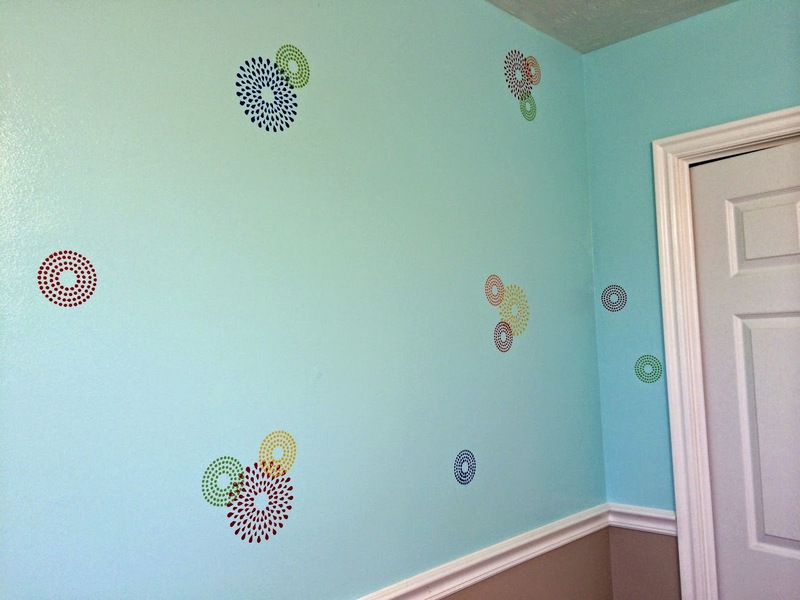 We finished painting the walls a couple days ago, so yesterday the girls and I drove around town looking for wall stencils. In my mind, I wanted to do something cool with the tan on the bottom part of the walls, and use up some more leftover paint. It turns out that for what I was looking for I would have to order it online. And since I'm on Spring Break this week, ain't nobody got time for that. 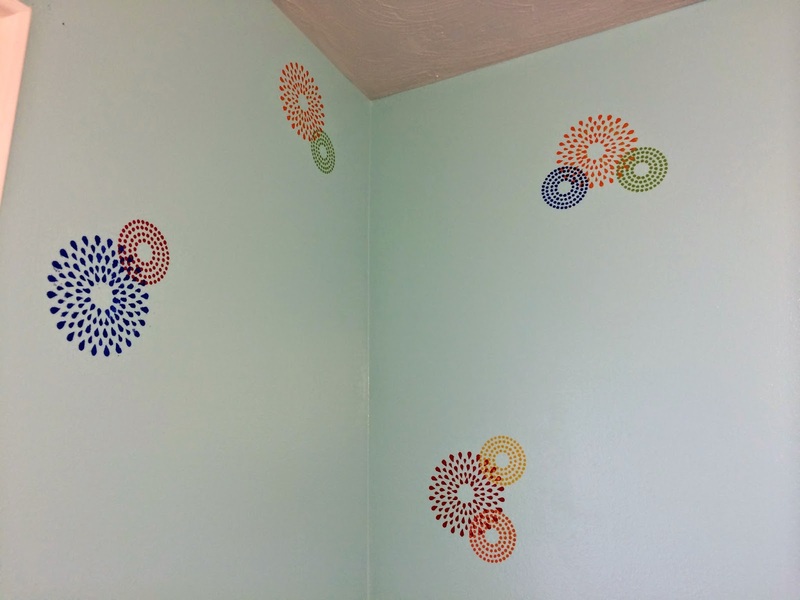 I ended up buying a package of Martha Stewart stencils at Michael's, still trying to create a vision in my head. This is what I came up with. I ended up just using craft paint I had on hand, and I did this without Stinkerbell's knowledge as she left for a sleepover shortly before I began messing around with the stencils. She came home this morning and exclaimed "Whoa! I love the fireworks on my walls!" They do kinda look like fireworks, so that's what we're going to call them. Last night I had a restless night of combining paint colors in my dreams. What color should we paint the bed? I think I want to paint it chartreuse. Something snappy. 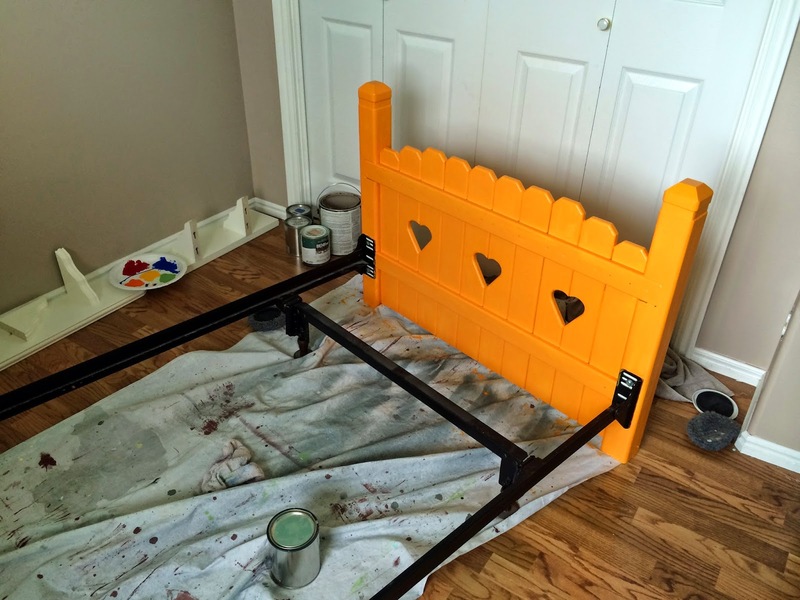 If I paint the bed chartreuse, then what should I paint the nightstand? The magnet board? I popped out of bed this morning determined to solve the color dilemma. The Stink and I went to Lowe's where I immediately grabbed my idea of Chartreuse, only to become distracted by the lovely oranges and yellows. I really had a rough time of it, but ultimately we both agreed on this bee-yute-iful shade of Hunter Safety Orange. 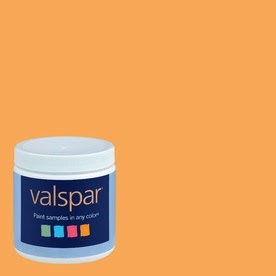 Valspar calls it Pumpkin Butter, but whatever. I big fat puffy heart love it. 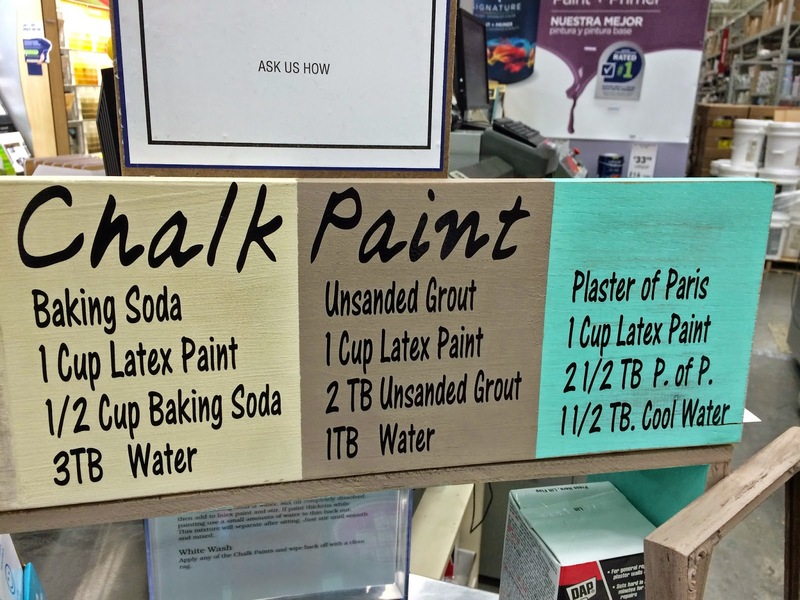 As we were having the paint mixed, I saw this sign at the paint counter, and do you know what? 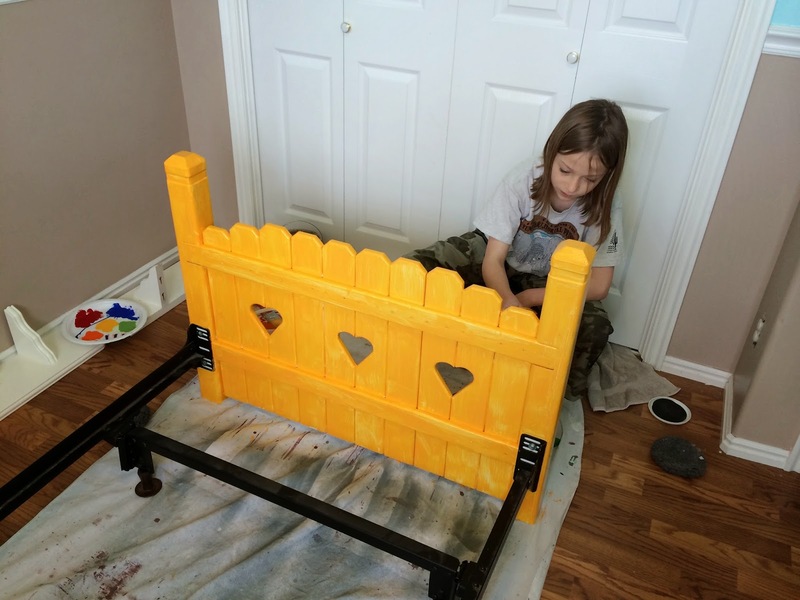 I've always wanted to try chalk paint, so what better time than now to do it. So we did. I went with the Plaster of Paris recipe on the right, and I really like how it turned out. The paint did have some chunks in it, which was sort of a pain because I had to keep scraping them off the bed while I was painting, but I really like the texture when it dries. This is just the first coat. And this was after three coats. I haven't decided if we will sand to rough up the edges a bit. I'm a little scared I'll screw it up. The color is so yummy though. I hit all the trim with a couple fresh coats of white semi-gloss and I'm giving it another hour before I start moving furniture in. I can't wait to see it all come together. We bought a delish Chartreuse fabric that I'm going to "upholster" the box springs with. I know I these colors seem pretty crazy, but I promise, in my head they look amazing together. But then again, I could be wrong. Stay tuned. Oh, and love the colors you have in the room! You're welcome, Bobbie. There are several versions out there as well. You can find a lot of info about it on Pinterest. I love that shade of blue! It's so pretty! I was just a Lowe's a few days ago and they have some really nice spring colors in the paint department. Thanks for the three different recipes for chalk paint. I've been wanting to try it too and I have some furniture I'm thinking of painting. I pinned it and will hopefully try it out soon. Good luck when you get to it. That's what I love about Pinterest--you don't have to worry about losing ideas because they are organized and waiting for you when you are ready. I'm sorry that it didn't work for you, Marsha.